Mercedes-AMG GT: Crafted in-house by AMG. CARMEL VALLEY, California -- The United States will be the biggest market for the new Mercedes-AMG GT and is expected to account for 25 percent of the car's worldwide volume. Mercedes-Benz says the new two-door sports car will stand out from its competition because, like all AMG models, each engine is built by one craftsman who signs it, said Tobias Moers, chairman of Mercedes-AMG, the brand's high-performance unit. He would not give sales projections, but AMG does not produce high-volume vehicles. The one-man-one-engine approach has been a draw for AMG owners, some of whom come to the plant to meet their engine's builder, he said. It will be equally important in the competitive luxury-coupe segment that the GT was developed in-house by AMG. Mercedes is using the tag line "Handcrafted by Racers: a sports car in its purest form." "If you want to be taken seriously as a sports car brand, you have to make your own car," Moers said. "We will attack a highly attractive new segment, and we will have to deal with world-class competitors." 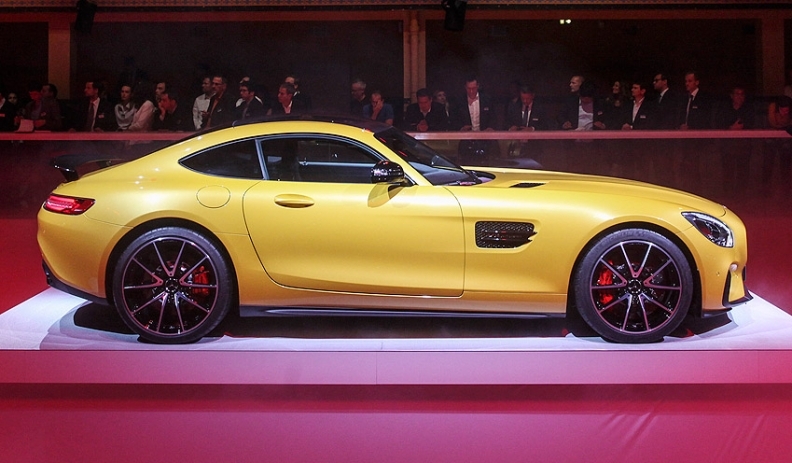 The two-seat GT features Mercedes' new Coke-bottle design language and a new AMG-developed engine. The range-topping 503-hp front-mounted midengine Mercedes-AMG GT S is expected to cost about $135,000 when it goes on sale in April in the United States. The entry-level 456-hp GT, with a base price of about $115,000, goes on sale a year later. Both are powered by an AMG biturbo V-8 and a seven-speed dual-clutch transmission. Moers said even though the GT doesn't go on sale until next year, he expects an AMG sales record in the United States this year. Last year, AMG sold 7,802 cars in the U.S., an increase of 17 percent over the prior year. Worldwide, Moers said AMG sales are expected to be higher than 40,000 in 2014 -- a record and up from last year's sales of 32,200.